They’re wretched, deadly and brutally fierce. Suicide Silence unleashes their unrelenting havoc at The Imperial on November 10th along with the villainous madness of Upon a Burning Body. Its advised to wear moshing approved footwear - rage at your own risk. SUICIDE SILENCE Imagine a high-speed bullet train in the throes of a 275 mph run as it suddenly makes a sharp turn without a single second to slow down. That’s the sound of SUICIDE SILENCE. The tight-knit band’s mash-up of death metal, grind and time-signature bending dissonance with structured, focused and undeniable grooves unquestionably shaped and led the emerging “deathcore” subgenre from the arrival of their 2007 debut, »The Cleansing«. 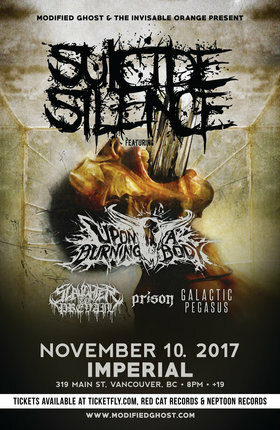 SUICIDE SILENCE was named “Best New Talent” at the Revolver Golden Gods Awards and had already dominated the Rockstar Mayhem touring festival by the time 2009’s »No Time To Bleed« broke into the Billboard Top 40. 'Wake Up' and 'Lifted'became underground classics, as SUICIDE SILENCE transcended the sub-genre they helped define and became peers with bands they’d grown up listening to as kids in California. UPON A BURNING BODY Prepare yourself for a brutal, unrelenting array of unabashed aggression and sheer ferocity that will beat you to oblivion. This is what UPON A BURNING BODY delivers each and every time. The San Antonio based group’s debut offering, The World Is Ours, caught the metal scene by storm with its crushing Pantera-esque grooves, dynamic riffing and captivating hooks. Their live performance is unmatched, which quickly had their name being spread by the masses throughout the scene. SLAUGHTER TO PREVAIL Death metal hailing from Russia. PRISON Is a harsh, metallic nightmare comprised of the very thoughts most people fight to suppress. The issues that are too taboo to talk about are mere stepping stones for this band. Disarming honesty and punishing precision are the main ingredients in this low-end remedy for whatever ails you. Brewing in the depths of Florida's muck since 2014, the artistic output of Prison has only gathered tenacity and edge with time. With an insatiable aim to bridge the gap between genres, boundaries serve only as walls waiting to be demolished. Above all, Prison is a no-holds-barred, unadulterated barrage of truth that will make your hairs stand on end with each and every line. Nü metal, alternative metal, metalcore... call it what you may, but at the end of the day, Prison is a beast all its own. GALACTIC PEGASUS Is best described as a progressive metalcore band from British Columbia, Canada. Their sound is mostly influenced by metalcore from the late 2000’s in addition to the more modern djent movement. By combining these two main influences, along with many others from each member, Galactic Pegasus has been able to create their own unique sound. The band was originally formed in 2012 as a solo project by founding member Andrew Baena. After receiving show offers, it was converted into a full-fledged band that now has two EPs, a full-length album, and a cross-Canada tour under their belt.